Essax have made a splash recently with the release of their curiously shaped Shark saddle, but they have an impressive pedigree with traditional saddles too. A prime example is the Essax Adrenaline R.
It is a saddle designed for racing and comes in at an impressive 157g, which is light compared to others at a similar price range and beats many that cost more than its £104. It comes in two different widths, 130mm and 142mm; this is the 130mm version. It also has some customisable options; you can change the colour or design and also the rail material. The model that I tested had an attractive black design with a green band running down the centre. It also has titanium rails, so it weighs around 25g more than the version with carbon rails. On the bike it also sits nicely on the rails, giving a low profile look that works nicely on my Cannondale Supersix. With the customisation available with the saddle, it would also be possible to match colour schemes, which is something I particularly like, as I find that having bright saddles that don't match the bike can be a bit of an eyesore. 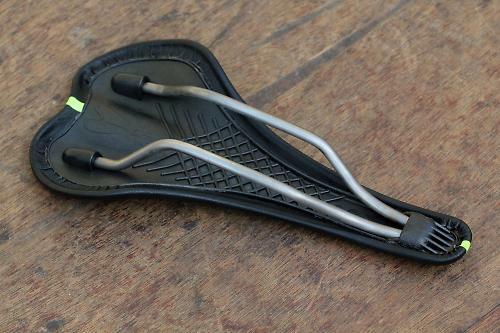 When riding, the saddle's flat design is apparent and you notice it's not the most flexible saddle. Although it's not uncomfortable as such, as you get further into a long ride you can feel that it is a saddle that has little flex and padding, but it makes up for in other areas. According to Essax: "padding is added to the key areas where the ischium sitbones contact the saddle to offer comfort where you need it most on a performance saddle". That certainly matches what I found. The padding is minimal across the majority of the saddle, but you can notice a slight increase in certain areas. Because the saddle is so stiff, it feels like you're not wasting any power in flex. It is worth noting though, that it saves your power, but it is certainly not a seat that is armchair-comfortable over many hours of riding. It includes the AF-Net system,which according to Essax " [has] been proven through totally independent testing to improve performance by an average of 4%". As I was testing this on the roads of Surrey and the Road.cc lab is yet to exist, I cannot verify these claims, but did feel a slight difference in power transfer when riding. I used this saddle in variety of conditions and surfaces from smooth dry tarmac through to wet cobbles. It is certainly better suited to smoother rides as the flat design and minimal padding means that you can feel the bumps on rough surfaces. This isn't necessarily a criticism of the saddle, as it is designed for racing and ultimately weight reduction and the improved transfer of power. But it is certainly worth noting that other saddles would provide more padding and comfort for a long sportive or tour. However it works very well as a fast racing saddle. Overall, the Essax Adrenaline R is a good saddle for those looking to improve their speed and power transfer. However, if you are looking for maximum comfort throughout a 200km ride, this is not the saddle for you. The Adrenaline R is designed for people who are looking for a saddle that will provide power and efficient transfer to the pedals. In this sense it works well, you can feel the difference especially when seated during climbs or trying to maximise speed on the flat. AF-Net Construction - a revouluntionary move forward in saddle technology. The AF-Net matrixthat is built into every Essax Saddle have been proven through totally independent testing to improve performance by an average of 4%. Very sturdy saddle that is the basis for its effective power transfer. It performs well during seated climbs and when looking for the extra push on the flat. Seems like a well made saddle, would predict that it would last for a long time. In terms of others in the same category the weight is fantastic, 157g with a claimed weight of 160g shows that Essax may even be underselling themselves. It is not hugely comfortable over a long period but all things considered, it could be far worse. A great saddle for the price, few others have the same performance for the money. It is an effective saddle if you are looking at speed and power which is ultimately what it is designed for. The additional power gained without the flex that you normally get with saddles at this price point. It is not the best saddle for long rides, its firmness is great for power, but not the best for hours on the road. A saddle that I really enjoyed using and has stayed on after the initial review period. The minimal padding may not suit more leisurely rides, but is certainly not the most uncomfortable saddle I have used. A well thought out design with a clear purpose that is achieved; very impressive.